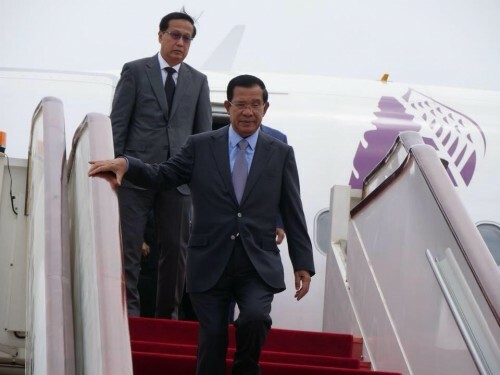 Cambodian Prime Minister Hun Sen and his delegation have landed China for the 15th China-ASEAN Expo (CAEXPO 2018) that will take place in Nanning, Guangxi from 12-15 September 2018. This afternoon, the premier is scheduled to meet with representatives of Chinese companies and 200 Cambodian students in China. CAEXPO plays a significant role in promoting China-Cambodia exchanges and cooperation. In 2018, Cambodia will serve as the country of honor for the second time. Diverse country of honor events will be held during CAEXPO 2018 to showcase Cambodia’s national image. Cambodian leaders will deliver speeches at the opening conference, meet with Chinese leaders, and attend the opening ceremony of “Charming City” Pavilion and China CEO Roundtable Conference. Cambodia’s characteristic artistic performance will be the warm-up of country of honor events. This is the premier’s first visit to China following the establishment of the 6th mandate Royal Government of Cambodia. Then, with the charming city-Kampong Thom’s Sambor Prei Kuk as the theme, Cambodia Pavilion will showcase Cambodian commodities, promote Cambodia’s infrastructural construction, SME development, education, tourism and other fields, and deliver a series of economic and trade events such as national presentation, investment policy and business environment seminar. 2018 marks the 15th anniversary of the establishment of the China-ASEAN strategic partnership, 15th anniversary of the inauguration of CAEXPO, as well as the 60th anniversary of the establishment of China-Cambodia diplomatic ties. CAEXPO 2018 will create more opportunities for China-ASEAN economic and trade cooperation, and further serve “Belt and Road” construction. China is ASEAN’s largest trade partner, and ASEAN is China’s third largest partner. Trade between the two rose 13.8 percent to 514.8 billion U.S. dollars last year.